A post on some good experiences with easy amp modification. For a long time, I really was content with this little box that gives five very loud and intense watts – more than sufficient a sound pressure for my living room studio. I only found the Jensen P 12 R speaker (I had chosen a special champ edition with a bigger speaker for more bass response) sounded too dull. But as I also have a cabinet with two Jensen P 12 Q, I tried this combination and was quite pleased. I found that my Les Paul sounded good as it drove the amp harder and produced some nice crunch, but with my Stratocaster it was, again, too dull. The amp didn’t quite react to my playing, sounding neutral at best. A book on tube amps (“A Desktop Reference Of Hip Vintage Guitar Amps” by Gerald Weber), a very practical and easy-to-read guide to some more understanding of tube amps, was the catalyst. 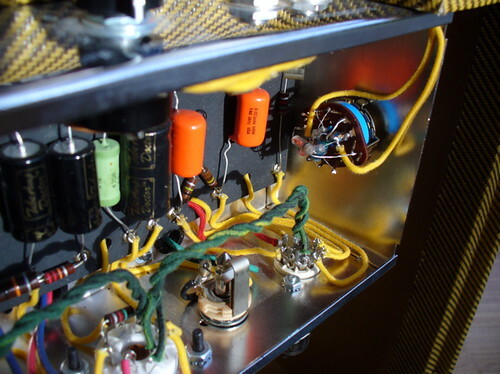 I brought together two ideas of which I had heard separately: The installation of a bright capacitor over the amp’s volume pot (as provided in many Fender amps, called the bright switch), and the installation of a multiple switch to house several caps of different values – making it possible to dial in different presets suiting each guitar or even each pickup separately. Remember the champ has but one volume pot – no tone control at all, and even the volume pot serves as on/off-switch in addition, thus canceling the memory of your last volume setting when turned off. I was amazed at how plainly audible the difference was! With a simple trick that – applied to guitar volume pots – is called a “volume bleed circuit” a vast curtain was drawn back, and I finally had the treble and mid frequency range desired. Nothing is added that wasn’t there before by this procedure – it’s just changing the balance between frequencies by adding something that the volume pot is taking away when not turned to maximum. Kind of reloading. By trying several different cap values you may affect only the very high treble, or include parts of the midrange, too. Gerald Weber mentions cap values from 47 pF to 120 pF. You can solder one or several caps to a switch, as I did, or solder the one you like best directly over the input/output of the volume pot, thus losing the original sound. A switch will also be connected to the input/output terminals of the pot. My multi-switch has six positions. I left the first blank to reproduce the unchanged, original sound. Then I added 33 pF, 47 pF, 100 pF, 120 pF, 150 pF. Lower values just add very high treble, as opposed to the higher values that increasingly allow for more middle to get through… I have already chosen some favorite switch positions for each guitar. So now there is sort of a tone control for my little champ that I mounted on the chassis where there was some space left. I do not mind reaching for it on the backside of the amp, but maybe that is not a good idea for everyone. 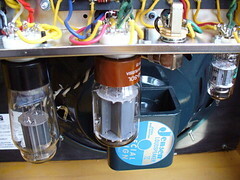 A second step of modification included exchange of all three tubes of the little amp. Instead of a 12 AX7 preamp tube I placed a 5751 that gives lower gain, but clearly more nice treble. Just crank up the volume a bit more than used to, and voilà an excellent sound! Gerald Weber in several instances mentioned a rectifier tube named 5V4 that replaces a 5Y3. It makes the amp a little bit louder, which was no aim of mine, but also gives more, and tighter bass. Since I wished to make the champ sound less “boxy” I had to add more bass as well as treble. To check bass response, the low “E” from an electric guitar (compared to other notes) was perfectly right. Then I tried several types of power tubes. First, different brands of 6V6, but then I switched to another tube (my favorite one on the modeling device “Vox Tonelab SE”) that is called 5881 (kind of a military rugged version of 6L6, but of different construction and sound). That’s when I experienced Strat-player’s heaven! Now that’s how this amp was meant to sound, and it sounds good with humbuckers, too. No matter a 5881 belongs in other amps, like the Fender Bassman – it just sounds great in my amp and makes it sound bigger. No problems so far. Last thing to do was loosening the four screws that hold the baffle board (a rather thin wooden front the speaker is mounted on) a little, so its extra vibrations can add to the impression of volume, of vibrating tone. I think this measure that is known since the old days put the sound of the internal speaker above the sound of my 2×12 cabinet. What’s also important with these small amps is to place them in a somehow elevated position so the speaker’s cone addresses the ear directly. Otherwise much treble and presence will be lost. Some months ago, I wouldn’t have dreamt of the sound quality and variability my champ has gained now. This was my first and only experience so far with “amp tuning”, apart from soldering some better tone caps to my AC 15 and changing all the tubes in my amps. Pretty successful for my purpose – I was amazed myself. Please feel free to ask questions.